Amalia de Gortari, MVZ is joined by Dr. Deborah Knapp and Dr. Duncan Hockley as she holds a recognition gift given in honor of her retirement at a reception Monday, October 29. 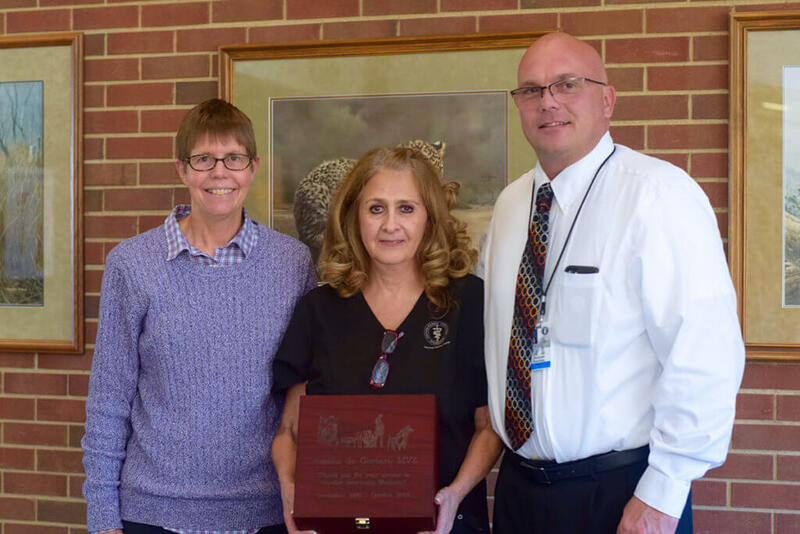 The Purdue Veterinary Medicine family came together Monday, October 29, to honor Amalia de Gortari, MVZ on the occasion of her retirement as oncology and radiation oncology technician supervisor in the Veterinary Teaching Hospital. Amalia came to West Lafayette in 1989 from Mexico, where she earned her Medico Veterinario Zootecnista (MVZ) degree, or Mexico veterinary medicine degree, at the Autonomous National University of Mexico. She then began volunteering in the Purdue University Veterinary Teaching Hospital’s ICU and was hired full-time in 1990. Amalia served as the hospital’s first versa-tech, and worked in surgery, medicine, community practice, diagnostic imaging, and oncology, as well as ICU. For the last 25 years, she has worked full-time in oncology. Her hard work was recognized when she received an award for excellence in veterinary teaching in 1997 and the College’s Outstanding Staff Award in 2006. Amalia de Gortari, MVZ greets well-wishers at a reception held in honor of her retirement in the Continuum Cafe. 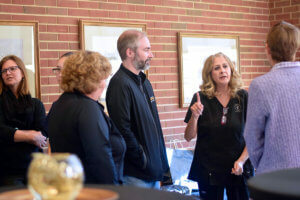 During the retirement reception, faculty, staff, and students listened as comments were made by Veterinary Teaching Hospital Director Duncan Hockley and Purdue Comparative Oncology Program Director Deborah Knapp, the Dolores L. McCall Professor of Comparative Oncology. Amalia was praised for “…leaving many, many legacies,” and as someone who will be remembered for her bright smile when she greeted passersby in the hallways. Amalia also recognized for “…being a champion with the international students.” Amalia and her family were born in Mexico and became American citizens in 2001. Her background and the understanding she gained from that have been comforting and reassuring to international students. Amalia was recognized for putting her caring personality into everything she does. “You will always be a part of the Purdue family, and we wish you all the happiness as you embark on a new exciting chapter of your life,” Dr. Hockley said. Congratulations Amalia!